The purpose of my book, In the Beauty of Holiness: Art and the Bible in Western Culture, is to help deepen the reader’s understanding of the power and magnificence of the Bible as a source for European art, and to provide rich particular examples of artistic achievement which has abiding spiritual and theological significance. Almost everyone is familiar with at least some great paintings representing scenes from the Bible; such subject matter dominates the great galleries. Artists in the biblical tradition have been much more, however, than mere illustrators of the Bible. They have actively participated in the interpretation of such stories, sometimes by reflecting theologians, sometimes by innovating in search of deeper understanding or even new doctrine. 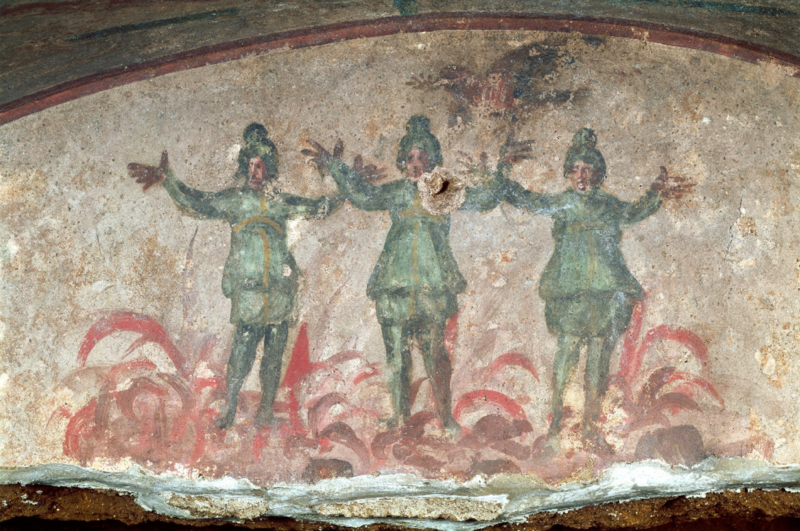 This activity of artists is already apparent in the catacombs of Rome by the third century AD, where a majority of the biblical subjects depicted are from the Old Testament narrative, but are clearly understood to be interpreted in the light of the Gospel. The frequency of images of the story of Jonah and the whale owes not just to intrinsic interest in the story itself, but to Jesus saying, “For as Jonah was three days and nights in the belly of the whale, so shall the Son of Man be three days in the heart of the earth” (Matthew 12:41). Early Christians saw this story as a sign of their own resurrection to come. But note that the larger biblical story is also about conversion of the Gentiles; just so, frequent images from the book of Daniel, such as that of the three young men in the fiery furnace (Daniel ch. 3) seem to reflect the prayers of Roman Christians that the emperors under whom so many suffered might themselves be converted, as was Nebuchadnezzar (Daniel ch. 4). Among the many later instances of such artistic biblical interpretation, one genre involves making typological connections of Old Testament to New Testament events and sayings more explicitly. Beginning with Jesus and Paul, then growing exponentially from the early fathers through the Middle Ages to Calvin, we find chains of paired narratives or sayings represented both verbally and visually. What they teach is that the Old Testament has abiding vitality and significance for Christians when understood not only as a record of divine providence in the life of Israel, but as predictive history with a profound spiritual dimension for life in Christ. Through understanding the connections, those “grafted into...and partaking of the root of the olive tree,” as Paul put it (Romans 11:17), that is, Christian readers of the Bible and artists among them, came to understand the historia humanae salvationis as one great story in which they too had a part. For almost every story in the Old Testament, they reasoned, there was a New Testament echo or fulfilment, if only one knew how to perceive it. In many ways, the readings of traditional liturgies – Old Testament, Epistle, Psalm and Gospel – were organized so as to draw attention to this doubling or pairing as a principle of unity in the Christian Bible. Artists in the medieval period were employed to teach the most meaningful pairings to those unable to read the biblical text—a majority of most populations until after the Reformation. The Biblia Pauperum, a Franciscan-inspired teaching text for those in pastoral ministry especially (featured in a recent ArtWay meditation by Laurel Gasque) is an important early example of the use of typologically connected Old-Testament and New-Testament narratives. It is ordered so as to show how in the Old Testament the New Testament is ‘concealed,’ while in the New-Testament stories we may see that the fuller meaning of the Old Testament is revealed, while it draws on two Old Testament stories rather than just one as prefiguring a New-Testament story. 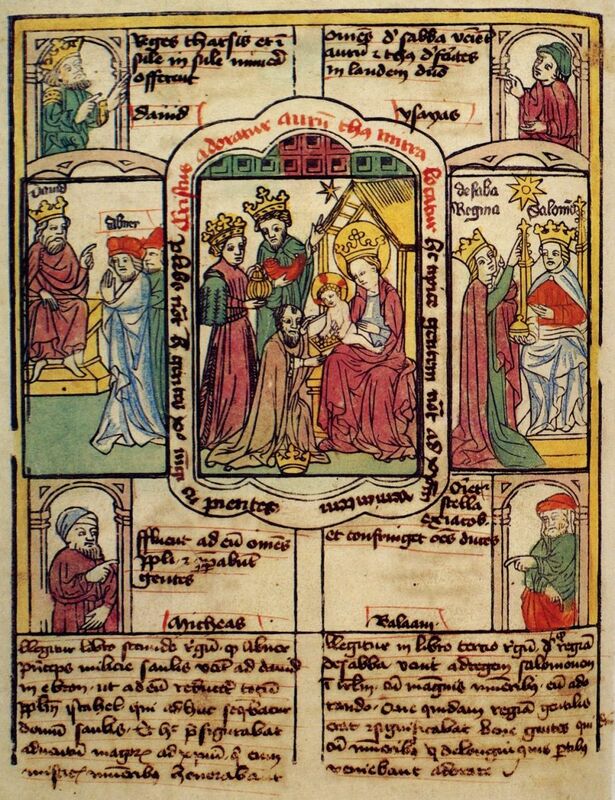 In the illustration below, the wisdom of the Magi in paying honor to the “new king born of the Jews, David’s royal son,” is seen to be anticipated on the left by the wisdom of Abner, formerly a confederate of Saul, in showing his fealty to King David (2 Samuel 3:6-21), and on the right by the Gentile Queen of Sheba who comes to consult the wisdom of Solomon (1 Kings 10:1-13; cf. Matthew 12:42). 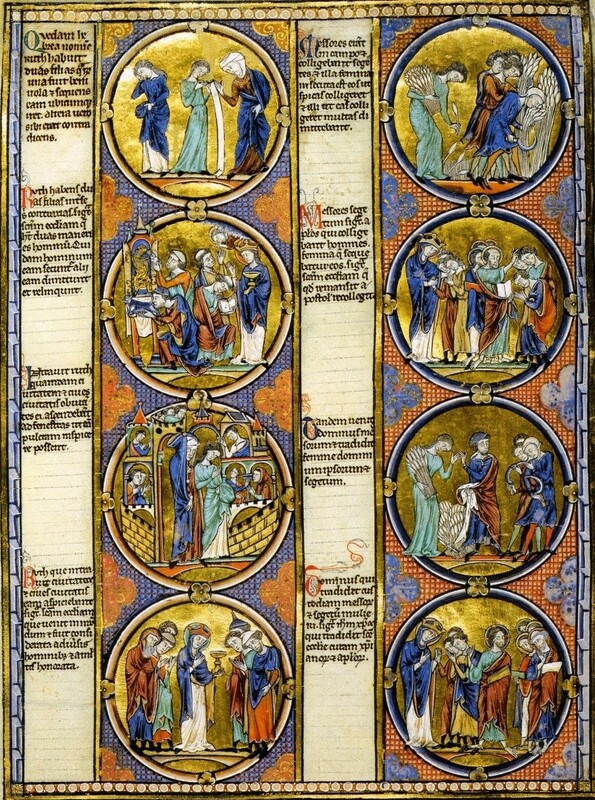 Another thirteenth-century example is the beautifully illuminated Bible moralisée, also a teaching Bible. Featured below is a page from that work that gives a good sense of its more extensive narrative design, in this case kept to single pairings for the most part. In this series of images on one page from the Bible moralisée, the story of Ruth the Moabitess and Boaz, the “kinsman redeemer,” anticipates the redemption of Israel and the Gentiles by Jesus, picking up the theme in both Testaments of spiritual marriage between the Lord and his people. 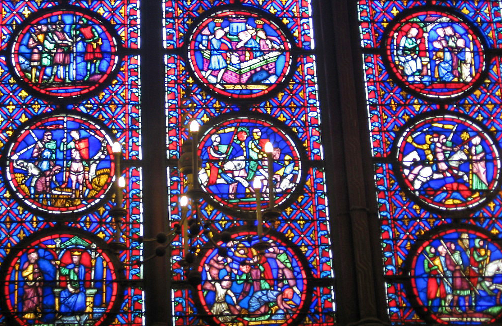 Yet even stories of shameful deeds in the Old Testament (the adultery of David and Bathsheba and the murder of Uriah) could likewise be read typologically into the New Testament and moralized, as in this example from the Sainte Chapelle windows in Paris, precisely echoing the typological method and design of the Bible moralisée. Here the traditional Jewish interpretation of the Akedah story, the binding and almost sacrifice of Isaac (Gen. 22) is in the foreground, with slight variations. The lamb stands waiting at the foot of a tree rather than caught in a thicket, whilst in the background is an image of Jesus carrying his Cross. The grief of Mary near the Cross is mirrored in the foreground grief of Sarah beside the tree. 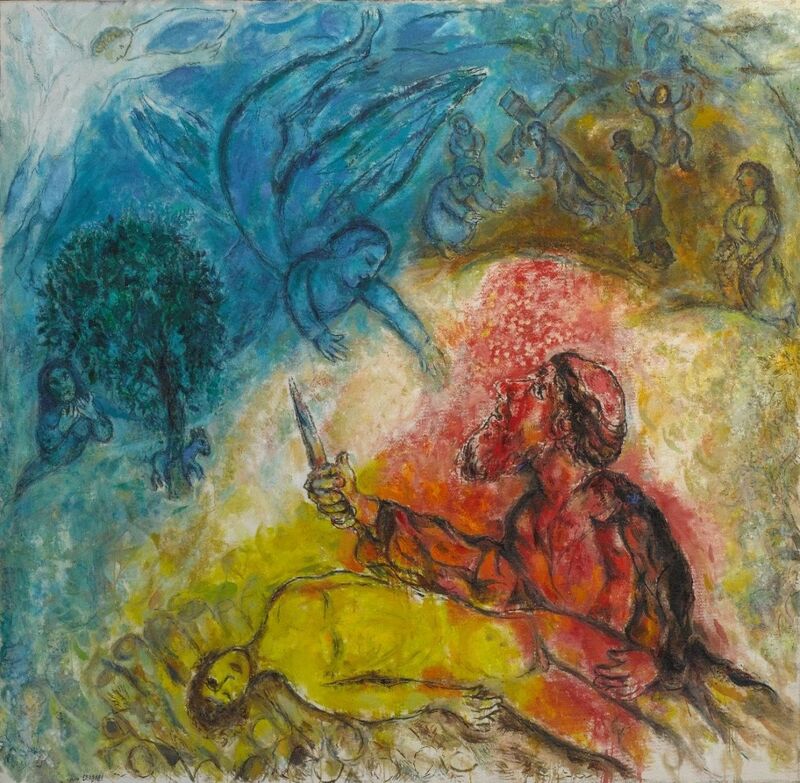 Chagall, born of Hasidic Jews, here connects faith in the Suffering Servant of Isaiah 52-53 to Jesus as to the whole story of the Jewish people from Abraham and Isaac to the Holocaust, in this way reclaiming Jesus for Judaism. Whereas the bulk of Christian typology connects Christians to the Jewish story, Chagall’s typology connects the Hebrew Scriptures to the New Testament by using the latter to lay claim to it from a Jewish point of view. The effect is to cause both Jewish and Christian viewers of his art to do a ‘double-take,’ to pause and reflect in a new way on the relationships between Jew and Gentile in biblical history. Such are the artworks and their stories, from the Tabernacle in the wilderness to the great medieval cathedrals, and from the Catacombs to Chagall, which In the Beauty of Holiness seeks to understand and celebrate. David Lyle Jeffrey: In the Beauty of Holiness, Art and the Bible in Western Culture, Eerdmans, 2017. Beauty is a highly significant subject in the Bible. So is holiness. In this study of Christian fine art David Lyle Jeffrey explores the relationship between beauty and holiness as he integrates aesthetic perspectives from the ancient Hebrew Scriptures through Augustine, Aquinas, and Kant down to contemporary philosophers of art. Incorporating sample artworks ranging from the Roman catacombs to Marc Chagall, Jeffrey demonstrates that the Bible has consistently been the most profound and productive resource for the visual arts in the West. He contextualizes Western European art from the second century through the twenty-first in relation not only to the biblical narrative but also to liturgy and historical theology. Lavishly illustrated with more than one hundred masterworks, In the Beauty of Holiness is ideally suited to students of Christian fine art and to general readers wanting to better understand the story of Christian art through the centuries. David Lyle Jeffrey, FRSC is Distinguished Professor of Literature and the Humanities, Honors Program and Senior Fellow, Baylor Institute for Studies in Religion, Baylor University, Waco, TX and Guest Professor, Peking University.